The theme for the next Trees & Hills anthology is WATER. As with all our anthologies, we are most interested in both fiction and nonfiction comics with a community-minded orientation – comics that show an awareness of connection to the world around them, and ideally aim to make some sort of contribution to it. If you can make it relevant to our region, so much the better. Hey everyone, I’m organizing a Halloween Comics Swap! A couple years ago I made a little comic to give to trick-or-treaters, and it was fun, so now I thought it’d be fun to have more people do it and trade them around amongst Trees & Hills folk. If there’s interest this year, we’ll do it next year with more notice, and maybe as an “official” T&H endeavor. How it works: Email me at colin@colintedford.com to let me know you want to do it. This is so I know there is interest, and in case there are mailing issues later. Then, make 30 copies of a Halloween-related minicomic (see “format” below) and give them to me in person or mail them to me at Colin Tedford, PO Box 645, Winchester NH 03470 with your name and mailing address so that I receive them by October 13. I will then divide all the comics evenly and send each participant a batch of 30 comics including ones by all the other participants (you should receive them about a week before Halloween). Format: Comics should be 2.75″ x 4.25″ – that’s 1/8th-letter size, a sheet of paper folded in half 3 times, similar to the size of candy given out at Halloween. They should be on colored paper (even with a cool comic on it, what kid wants a piece of plain copy paper for Halloween?) and at least 8 pages long to make it truly booklet-like. They should, of course, be suitable for kids. If you don’t have (or like) trick-or-treaters you can give them out at a party, leave them around town – whatever you like! Examples: The original one I did, with a clever accordion-style fold featuring comic on one side and puzzle on the other – the problem being they didn’t want to stay closed & so need to be tied, or well-flattened under a heavy book (read the reformatted comic portion here). The second comic, for which I haven’t drawn the puzzle yet. I look forward to seeing your spooky comics! The Windham Solid Waste Management District in Brattleboro, VT is looking for someone to illustrate some recycling awareness strips based on pre-existing descriptions & scripts. The deadline for applications is May 30; the full call for submissions is here. 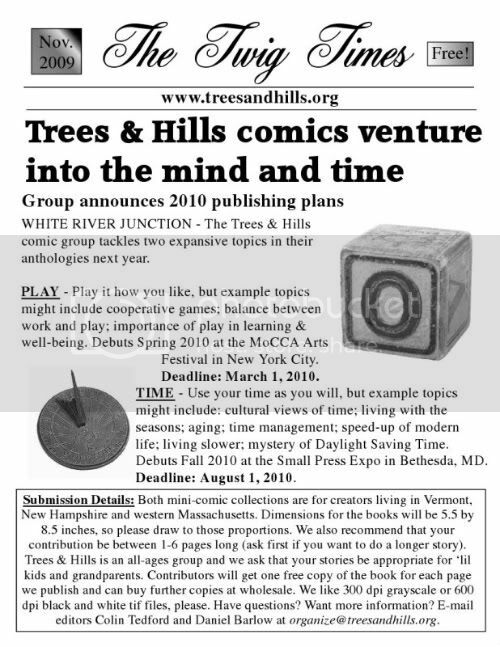 The Trees & Hills comics group is looking for your comics and cartoons about food for a new anthology to be published early this fall. SEEDS, our fifth anthology featuring creators from Vermont, New Hampshire and western Massachusetts, is themed around food – why we like it, why we need it and where we get it. Trees & Hills announce details of new space-themed anthology! MONTPELIER, Vt. – On October 4th, 1957, the Soviet Union shot an object the size of a basketball into space. And the world was never the same again. 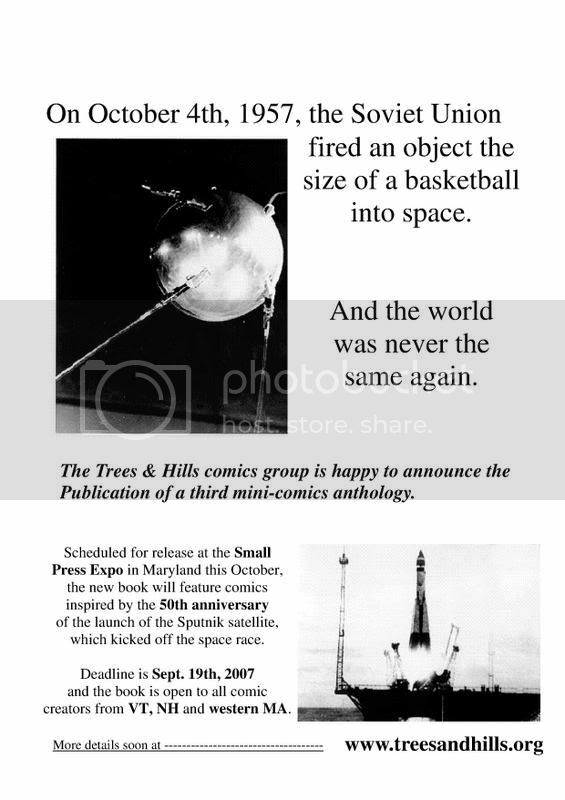 To celebrate the historic launch of the Sputnik satellite, the Trees & Hills comics group of Vermont, New Hampshire and western Massachusetts will publish a mini-comics anthology featuring cartoons inspired by the event that kicked off the space race. The anthology book, the second one published by Trees & Hills this year, will be released in time for the 2007 Small Press Expo in Bethesda, Maryland in early October. The deadline for submissions is Sept. 19th and anyone interested should soon contact the group co-founders, Colin Tedford and Dan Barlow. We’re also looking for someone to arrange an awesome cover image for the book, which would obviously be eye-catching and cosmic. There is a strong chance that the cover will be screen-printed this time too! Anyone interested in drawing the cover, please let us know. The size of the mini-comic anthology will be 5.5 x 8.5 inches and it will be black and white. We are mostly looking for work that would appeal to people of all ages, so if there is a question about content or style in your cartoon, please just ask us first. All contributors will receive one copy of the comic per page of their work we publish and can buy further copies at cost. It will be for sale at conventions, on-line and at various retail outlets in the three states. Also, please do not send original art! High-quality scans of the cartoons can be e-mailed to either Dan Barlow at barlowdaniel at gmail dot com or Colin Tedford at colintedford at gmail dot com. Snail mail photocopies can be sent to Colin Tedford, PO Box 645, Winchester, NH 03470 or Dan Barlow, 182 Main Street #2, Montpelier, VT 05602. 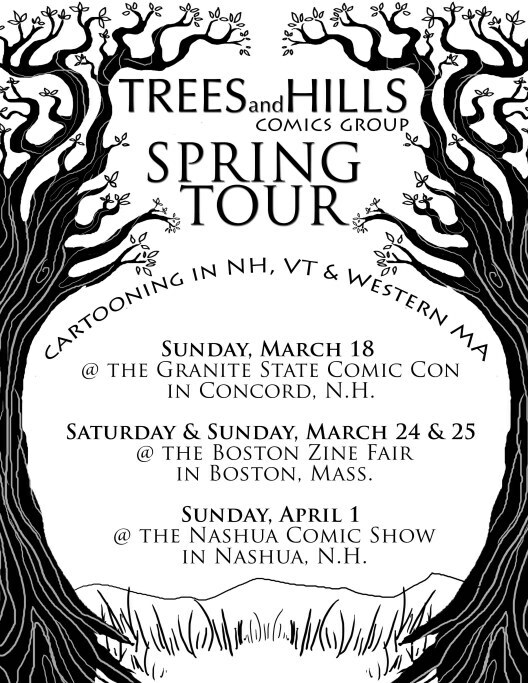 The Trees & Hills comics group formed at a 24-Hour Comic challenge in Brattleboro, Vt. nearly two years ago. Since then, the group has published two anthologies featuring new work by regional creators such as Stephen R. Bissette, Cat Garza, Marek Bennett and Colleen Frakes. The deadline for the Keene Free Comics TV Turnoff Week Special has been extended to the end of this month – email your submission to colintedford at gmail dot com (previously-drawn items are fine, as long as they fit in). Also, don’t forget to come see us and other fine cartoonists and zinesters at the Boston Zine Fair this weekend (March 24-5)! In addition to the above events, 3/19 is the deadline for the Keene Free Comics TV Turnoff Week Edition, and 3/20 is the Pioneer Valley Comic & Cartoon Schmooze – click over to our fancy new Calendar for details on all these things. Also, Part Two of the awesome HOURLY COMICS DAY CROSSOVER is up on the Comics page. If you are hoping to get your comic into the Brattleboro Commons, you need to get them to Jade Harmon (commonscomics at gmail dot com) by March 1 – see the call for submissions for details. interest and strip examples/proposals from as many people as soon as possible. • Space is being decided on, but anticipate to work 8" x 3" print size at the least. in mind. Nothing too experimental, please. should be able to exist on their own. • Deadline-savvy cartoonists only, please. • Submissions are sent electronically.